The Fourth Annual Boatnerd Badger Gathering starts the 2003 boat watching season. A round-trip crossing of Lake Michigan from Ludington, Michigan to Manitowoc, Wisconsin on Saturday, May 31, 2003, aboard the Lake Michigan Carferry SS BADGER. 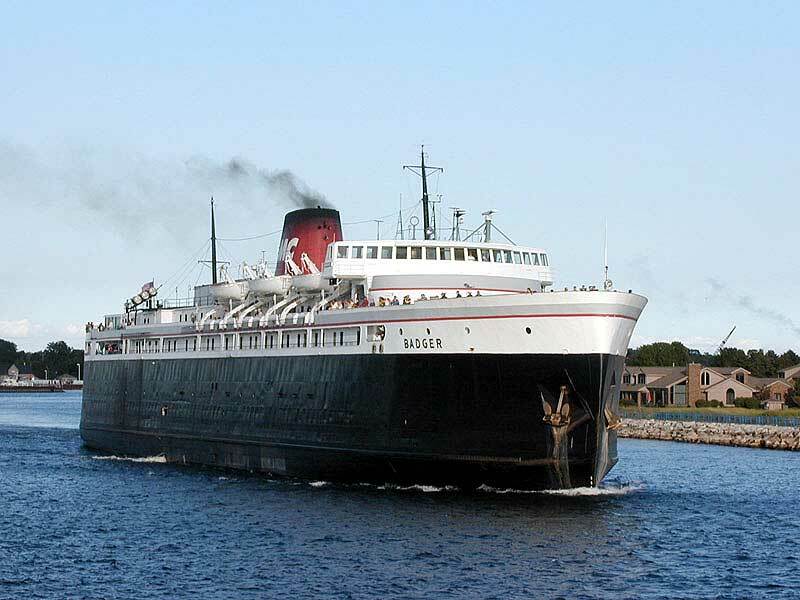 Join us in celebrating the 50th season of the only coal-fired steamer left on the Great Lakes. Visit the Wisconsin Maritime Museum in Manitowoc and see the operating restored forward engine from the legendary railroad ferry Chief Wawatam, and the WWII submarine Cobia. Special Feature – FREE Lee Murdock concert on the Badger during the trip over and back. Special Boatnerd round-trip is only $48.00 per person. Optional Friday night, May 30, Badger Boatel - $59.00. Stay overnight in a Badger stateroom. Staterooms sleep two at the same price. Includes Continental breakfast. Optional Saturday Wisconsin shoreline cruise - $35.00. Includes complimentary appetizer buffet, non-alcoholic beverages, special ‘50’s themed entertainment and a special “50th Anniversary” Badger souvenir. Optional Wisconsin Maritime Museum tour - $7.00 per person Boatnerd rate. On Board Slide Show during trip – Bring a tray of your best slides to share with other Boatnerds. Meet at the Badger. Stay overnight in a Badger stateroom. Possible tours of the Badger pilothouse and engine room. Meet your fellow boatnerds and exchange stories and pictures. 12:00 pm (CT) - Arrive Manitowoc. 6:00 pm (CT) – Depart Manitowoc aboard Badger. Space is limited for the Friday night Badger Boatel. Call Badger at 800-841-4243, or make reservations on line at www.ssbadger.com/reservations. Ask for the Boatnerd rates. Have a credit card ready. You will be charged a $25.00 deposit which will be credited to the cost of the trip.